It might not seem like it considering how crazy the weather has been across much of the country, but warm weather is right around the corner. That means it’s time to pack away those winter coats and gear up for spring and summer. While you’re getting ready to build your summer wardrobe, don’t forget to ditch those old bent sunglasses you’ve been using and upgrade to a fresh new pair. 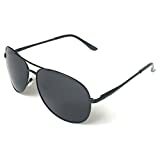 Lucky for you, Amazon is running a big sale right now on the best-selling aviator sunglasses on its entire site. The J+S Premium Military Style Classic Aviator Sunglasses are on sale right now for just $16.99, which is 58% off their full retail price. This is a terrific deal, so get in on the action while you can.